You know the muffins you see in every coffee shop? The giant ones with crunchy tops and moist cake-bread centers? 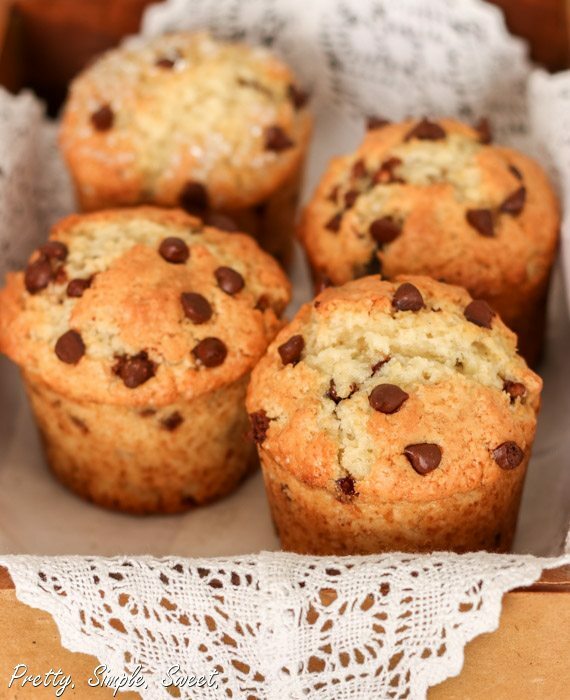 Today I want to share with you a fabulous recipe for these classic bakery style chocolate chip muffins. As a little girl, I’ve visited the United States at least once a year. I LOVED IT. What fascinated me the most about the place was that everything was HUGE. The stores, the streets, the buildings. THE MUFFINS! They were so big and tall and crunchy. I liked sitting at coffee shops in the mornings, watching businessmen and women, wandering in and out, getting their coffee with a giant muffin. Those are such sweet memories! So far I have tried many different muffin recipes, searching desperately for just the right one. Most of the recipes produced more of a cakey texture, which is also delicious, but nothing like the real thing – the ones we love to snack on at our favorite bakery or coffee shop. Perfect both in texture and taste. Many argue whether there is a difference between a muffin and a cupcake (if you eliminate the frosting). 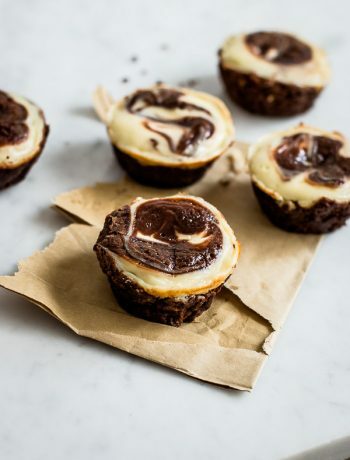 The thing is, no matter what the texture is, if you bake it in a muffin pan, it’s a muffin. Only if it has frosting, can you call it a cupcake. So let’s not be petty about the name for a second and just talk about the texture. There is the cakey-texture muffin and the crunchy-top bread-cake muffin (which is the one we talk about today). 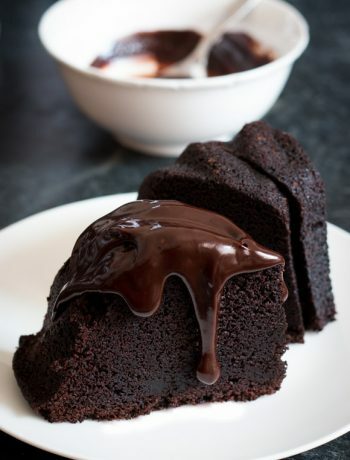 When I make cupcakes I use a recipe that produces a tender, moist cake like texture. However, when I make a classic muffin, I imagine creating a product which is half bread – half cake and not too sweet. *What liquid should you choose? It depends. When I make classic chocolate chip muffins I like the mild taste of milk, because buttermilk, yogurt and sour cream give more of a bitter taste than milk. However, all of them make much moister muffins than milk does. The muffins will also keep longer and better due to the moisture. Believe me, I’ve tried them all 🙂 When the muffins contain fruits or other add-ins with a dominant flavor, I would definitely use buttermilk, yogurt or sour cream for more moisture. In many recipes you will find that there are more eggs and more oil/butter than in this recipe, but with similar amounts of flour and liquid. More eggs and oil/butter will produce a prettier, richer, cake-like texture with a smoother top. Making classic muffins is easy! You will need two bowls. In one put all the dry ingredients (including sugar), and in the other combine the eggs with the milk and oil/butter. Then add it to the dry ingredients and mix with a spatula or a wooden spoon. Mix as little as possible-just until the ingredients are combined, otherwise your muffins will turn out tough, heavy and flat. The batter will look lumpy and unattractive, which is exactly how it should be. Try to imagine how a muffin from a bakery looks like – its crusty top is lumpy and uneven. This method of mixing is the reason why. Last thing is to add your chocolate chips/fruits or whatever it is you choose to add to the batter– about 1-1 1/4 cups total. Mix just until combined. Fill your muffin pans with batter almost all the way to the top. In order to get pretty domed muffins, start by baking the muffins at a very high temperature (about 425F) and after a few minutes lower it to the temperature that the recipe suggests. This way, the muffins rise quickly and the outside edges will set faster than the center, causing the muffin to have a peak. I’ve had my share of flat, spreading (batter spreading to the sides instead of rising up) muffins and after a little research, starting with a higher temperature has helped me solve this issue for good. If the muffin tops start to brown too fast on the outside but are not fully baked yet, open you oven and cover the pan with aluminum foil. Fill any empty tins in the muffin pan half full of water for even baking. Don’t over mix the batter. I know, I’ve mentioned it already, but it’s important. Mix just until all the ingredients are fully combined. For this recipe, the batter should look a bit lumpy. Lumpy is good! Baking time differs if you make mini muffins (8-12 mins), standard muffins (15-20 mins) and jumbo muffins (25-35 mins). You’ll know it’s done when a toothpick comes out clean, but not dry. Preheat oven to 425F/220C degrees. Butter 12 muffin cups or line them with liner papers. In a large bowl sift together flour, baking powder and salt. Add sugar. In a medium bowl, mix the egg with the milk, oil and vanilla extract. Pour the wet ingredients into the dry ingredients and fold with a wooden spoon or a rubber spatula just until combined. Do not overmix. The batter should be quite thick and lumpy. Fold in chocolate chips. Divide the mixture between the muffin cups almost all the way to the top. Bake for 3 minutes and then reduce the oven temperature to 375F/190C and continue to bake for an additional 12-17 minutes (this is for standard size muffins. See post notes for jumbo and mini muffins baking times) until a toothpick inserted into the center of the muffin comes out clean. Cool for 10 minutes and then move to a wire rack to cool completely. -If you use buttermilk, yogurt or sour cream instead of the milk, replace ½ teaspoon of the baking powder with ¼ teaspoon baking soda. -Muffins are best the same day they are made. -Muffins can be frozen for up to 2 months. Sounds great! Gonna try it! I like it that you don’t use butter, but use Canola oil instead. Yes you can, but I suggest starting with half brown sugar and half white sugar to see if you like the result first. 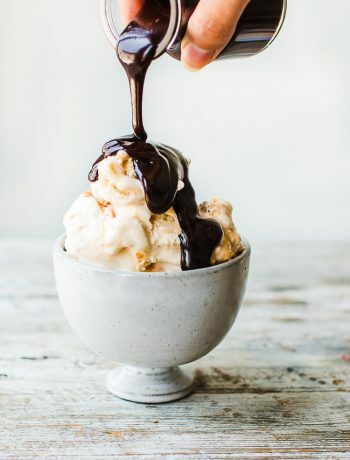 Brown sugar adds moisture and contains molasses, so it changes the texture and flavor. Also, the color of the muffins will be slightly darker. Before you add it to the other ingredients, put it in a bowl and break any lumps with a whisk or with your hands. Hi, just wondering what did you top it with? is that just sugar? does it just stick on? These are beautiful, bakery-style looking muffins and luv the textured crowns! 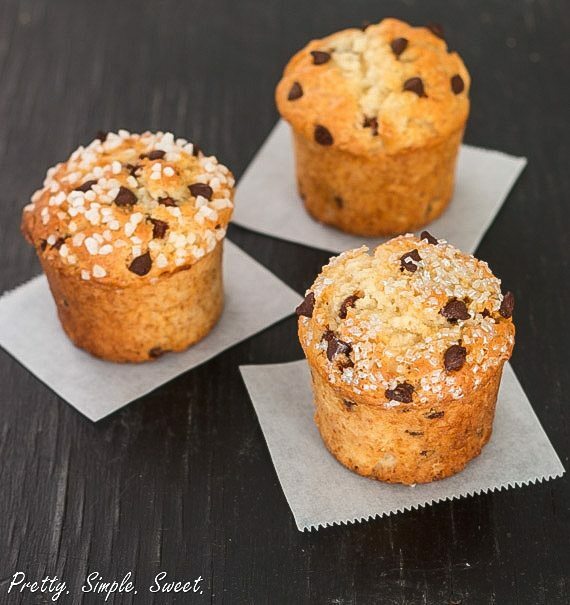 I like how the muffins have straight sides – bakery style (instead of the slant), did you bake these muffins in a regular muffin/cupcake pan or another type of mold or pan? Hey, can I use butter instead of canola oil? How much butter will be required and do the muffins remain the same? 🙂 thanks. Yes you can – the muffins will taste really good with butter 🙂 Substitute the oil with 75 grams/2.6 ounces melted butter. I added strawberries white chocolate chips and a little cheesecake mixture , I over filled by accident but they were delicious mess ! hi! Thank u for the great tips. If we wld like an eggfree breadlike muffin, how wld u suggest replacing the egg in the recipe? Hi Preetha! 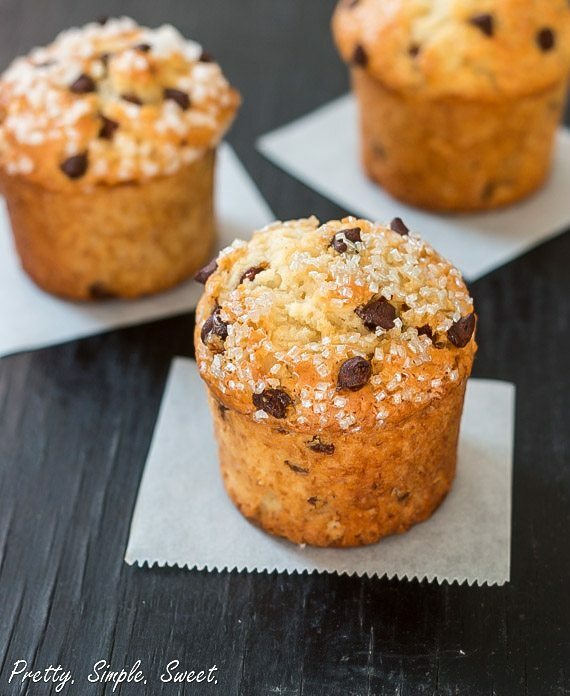 I’m glad to share my tips 🙂 I haven’t yet tried a bread-like muffin recipe without eggs, but you can try replacing the egg with 1/4 cup applesauce, yogurt or mashed bananas. I can’t tell you how the texture and flavor will be though, since I haven’t tried it myself. If I may add my penny 🙂 – 1 table spoon ground flax seeds and 3 table spoons of hot water, let it sit for few minutes till it thickens. Thank you for sharing Liza! I made these this morning, they were perfection! The texture was wonderful. I was looking for a muffin to make and found your blog. You are now bookmarked! Thank you – I really enjoy your blog. Hello Shiran, I tried the recipe today and it really worked out well! Hi Furkan 🙂 I’m glad the recipe worked out well for you! The tops will eventually get soft due to moisture, but it shouldn’t happen in an hour. When I make them, they stay crisp and crunchy for much longer! I’ll make sure to check this out the next time I make them! Hi. If I wanted to make these into chocolate muffins with white chocolate chips;how would you modify the recipe ? Hi Esther 🙂 here’s a link to my chocolate muffin recipe. Instead of the chocolate chips in the recipe, you can add white chocolate chips. Hi! Since baking soda must combine with acidic ingredients (such as buttermilk, cocoa powder etc. ), it isn’t possible to substitute baking powder with it. if choco chips is not available what will be the options? You can cut chocolate bars into chunks and use it instead. Can I use olive oil instead of the other oils you suggest? Hi Andrea! Basically you can and the texture would be fine, but olive oil has a strong flavor, so you might want to use half olive oil and half canola/vegetable oil. Hi Shiran, I can’t wait to try your recepi! Just would like to know will it be okay if I use moisture of butter and coconut oil instead to canola oil? Will that taste good? Hi Ava! You can use 70g melted butter instead of the oil, and it would taste great. Coconut oil is ok to use, too, but would affect the flavor. I only have self raising flour at home. How much baking powder in addition I may need to add? Hi Cher, if you want to use self-rising flour, you’ll need to omit the baking powder and the salt completely. How would we turn this recipe into a blueberry muffin recipe? Besides substituting the chocolate for blueberries, are there any other changes? You can substitute blueberries for chocolate, or you can make my blueberry muffins recipe. Hello! This recipe is an absolute favorite! Couldnt stop myself from finishing a batch in one sitting. May i ask if it’s ok to store batter chilled in the fridge? And for how long? Thanks! It’s better to bake the muffins after making the batter. I suggest to bake as many muffins as you like, and then freeze in an airtight container. Bring to room temperature or rewarm before serving. They stay fresh and taste delicious that way. I am just wondering what will happen if I totally omit the chocolate chips… I am not able to find them any where. Will it affect the taste? I think it will… But I want to confirm! Btw, recipe is GREAT! 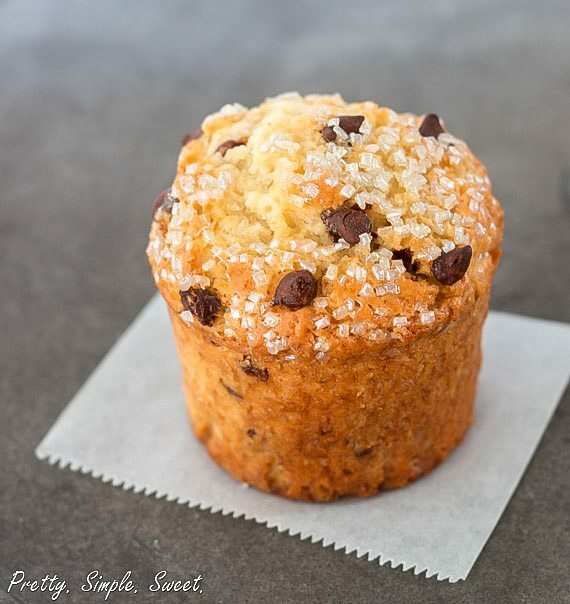 The recipe is a good base for other flavors or add-ins, but if you don’t want to make chocolate chip muffins you can search my other muffin recipes.